Why engine can perform a rotation outpu ? it because the engine generating power from a combustion. The power of combustion pushing down the piston. But the movement of piston must produce a friction between the cylinder and the piston ring. In a long time, this friction will cause wear between the two components. That's why older engine have less power complaints with low compression pressure. If the cylinder is worn out, it means the power is also hampered. So it needs to be over size or replacing this one. But to know whether the engine cylinder is still feasible or not, we need to make measurements. It will calculating the size of the cylinders and engine block wear out. So how to step, consider how measure cylinder block using cylinder bore gauge below. Before we go any further, let's understand the meaning of these two words. Tranquility and innovation have different meanings. Tautness, is a cylindrical wear when viewed from the side of the cylinder. This form of is tapered because there is a different size of the lower and upper cylinders. This difference will show a great tune. Wear out, is a form of engine cylinder wear when viewed from the top. The normal cylinder, will definitely be a perfect circle when viewed from above. But when it form more oval, then it might be a signal that showing the cylinder wear out. How To Measure Cylinder Block Diameter ? To measure the diameter of engine block, we need a special tool called Cylinder Bore Gauge. This tool can measure the diameter of the cylinder with precision reaching 0.01 mm. But before making a measurement, we need to make some setting on this tool. Dial gauge. This component will show the size scale with units of milli meters. Lock position. This component serves to hold the dial gauge remain silent when bore gauge is used. Grip. This component serves as a handle when applying a bore gauge. Replacement rod. Component of a rod of varying length to measure many cylinders having different diameters. Replacement washer. Similar to replacement rod, but replacement washer has a small thickness. Ranges 0.5 mm. Measuring point. In the form of a bulge, when pressed it will move the needle of dial gauge. 1. Steps to adjust the bore gauge cylinder. To make the adjustment, we need to know normal specification of cylinder diameter, you can find this specification on the service literarure each car or you need to measure directly using vernier caliper. But you need to know that this measurement is not a real measurement, because we just need a scale to set the right replacement rod. 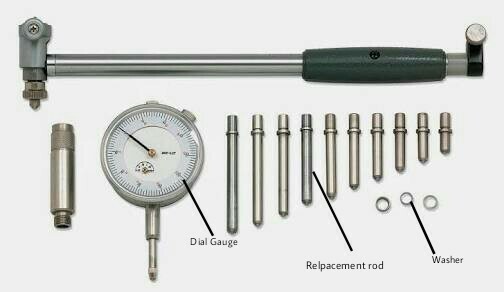 If you already know the diameter of cylinder then, continue to assemble the cylinder bore gauge. Start with installing the right replacement rod on the bore gauge. Suppose the diameter of the cylinder is 62.05 mm. Then we choose a replacement rod with a length of 60 mm plus replacement washer with a thickness of 3 mm. So a total length is 63.00 mm. Because we will measure a wear. Components that experience wear and tear must have an enlarged diameter. If we choose the replacement rod of the same or smaller than the diameter of the cylinder, then the measuring point can not be depressed when taking the measurement. 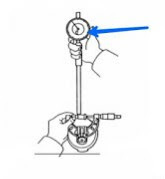 Once installed, set the dial gauge to zero using the micrometer. Position outer micrometer at size 62,05 mm, put the cylinder bore gauge (replacement rod parts) on timble micrometer. Then the measuring point will move and the dial gauge needle moves. Set the dial gauge scale to zero position on the dial gauge needle. 2. Step to Measure Cylinder block diameter. Perform measurements inside the cylinder. There are three measurement positions of each cylinder that is on the X and Y axes of each upper, middle and lower positions. The X axis is the line that intersects the engine horizontally. While the Y axis is the line that cuts the machine vertically or elongated. So total, there are six measurement each cylinder. How to measure it ? input the cylinder bore gauge into the cylinder. Then, shake this tool left and right while watching the dial dial indicator. We need to pay attention to the farthest point of moving needles. Because this point will show the difference in diameter of the cylinder with a standard diameter. Perform this measurement at each position of each cylinder. To calculate wear out, we need to find the difference between the measurement of X axist and Y axis at each position. While the tautness, we can know by finding the difference in measurement of the top and bottom diameters on one axis. Another way of measuring the diameter of the cylinder. 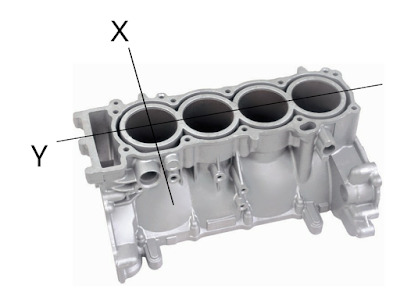 The step above is the correct procedure to measuring size of cylinder block. However, in its application sometimes encountered several constraints such as measurement results that are smaller than the standard. It could happen because each engine has a different diameter even made in the same factory. For that there is simple way that many technicians use to measure engine block diameter. The first step, we need to see the standar diameter on technical specification. Remember, we need to know the right specification and dont measure with vernier caliper. Why, bceause this data will be our benchmark to get the wear out. Once you see the right standar diameter then assembly the bore gauge and, make direct adjustments inside the cylinder. Like the above procedure, there is six position each cylinder but for first enter the cylinder bore gauge to the bottom position of cylinder to set the bore gauge. In this case, we are based that the bottom position is an area that does not experience friction with piston rings. So the diameter is still standard. Continue to move the bore gauge right and left. Notice the farthest point of the dial gauge needle. Position the dial gauge scale to zero position exactly on the needle moving to the furthest point. Furthermore, we directly conduct the measurement of the diameter of the cylinder in the six positions as described above. In this case, to know the cylinder diameter you should looking for the difference between standar diameter as benchmark and the result of measurement. Once you find the correct diameter, you can calculate the wear out and tautness of cylinder. From this data, you can conclude the condition of engine block. 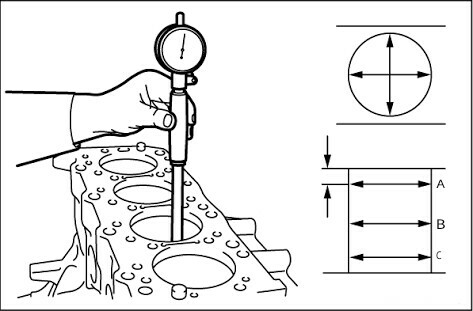 Similarly, guidance on how to use cylinder bore gauge to measure the diameter cylinder. Aside from the cylinder's sharpness and wear out, diseases of the engine can also be caused by non-standard pistons. Check how the piston check to be more clear. Hope can be useful.